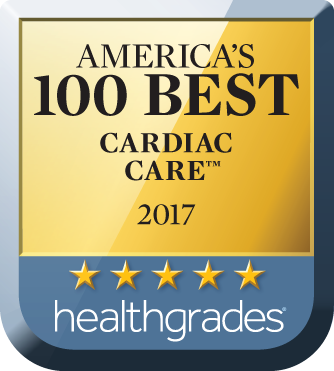 [Boynton Beach, Florida] – Bethesda Hospital released today that it has been recognized by Healthgrades as one of America’s 100 Best Hospitals™ for Orthopedic Surgery and America’s 100 Best Hospitals™ for Cardiac Care for 2017. Healthgrades, the leading online resource helping consumers make informed decisions to find the right doctor and the right hospital for the right care, evaluated nearly 4,500 hospitals nationwide for 34 of the most common inpatient procedures and conditions. * Healthgrades identified the 100 best-performing hospitals across all conditions or procedures evaluated with orthopedic surgery. These achievements are part of findings released in the Healthgrades 2017 Report to the Nation. The new report demonstrates how clinical performance continues to differ dramatically among hospitals nationally, regionally and at the local level, and the impact that this variation may have on health outcomes. For example, from 2013-2015, if all hospitals as a group, performed similarly to hospitals receiving 5-stars as a group, on average 223,412 lives could potentially have been saved and 162, 215 complications could potentially have been avoided. ** A 5-star rating indicates that a hospital’s clinical outcomes are statistically significantly better than expected when treating the condition or performing the procedure being evaluated. “This tremendous recognition is truly a reflection of outstanding team effort among our orthopedic-, neurosurgical, and orthopedic spine surgeons for Orthopedic Surgery, and it is a tremendous testament to the outstanding work of our cardiothoracic surgeons, interventional cardiologists and medical cardiologists who dedicate themselves to providing the highest quality of care and safety for our patients,” said Roger L. Kirk, FACHE, President and Chief Executive Officer of Bethesda Health, Inc.
*For its analysis, Healthgrades evaluated approximately 45 million Medicare inpatient records for nearly 4,500 short-term acute care hospitals nationwide, assessing hospital performance relative to each of 32 common conditions and procedures, as well as an evaluation of comparative outcomes in appendectomy and bariatric surgery using all-payer data provided by 18 states. Healthgrades recognized a hospital’s quality achievements for cohort-specific performance, specialty area performance, and overall clinical quality. Individual procedure or condition cohorts are designated as 5-star (statistically better than expected), 3-star (not-statistically different from expected) and 1-star (statistically significantly worse than expected) categories. The complete Healthgrades 2017 Report to the Nation and detailed study methodology, can be found at www.healthgrades.com/quality. Founded in 1959, Bethesda Health, Inc., is a healthcare organization serving South and Central Palm Beach County with two not-for-profit hospitals, Bethesda Hospital East and Bethesda Hospital West, that provide comprehensive healthcare services, including Bethesda Orthopaedic Institute, Bethesda Heart Hospital, Cornell Institute for Rehabilitation Medicine, the Center for Women and Children with maternity, a Level III NICU, pediatrics and PICU, and accredited centers for Stroke, Chest Pain and Heart Failure. With 675 physicians on its Medical Staff and 2,700 employees, Bethesda Health is an official teaching hospital of the Charles E. Schmidt College of Medicine at Florida Atlantic University and has residency programs in internal medicine, general surgery and emergency medicine. In addition, Bethesda Health Physician Group is Bethesda’s employed multi-specialty practice that serves Delray Beach, Boynton Beach, Palm Beach and Wellington. In November 2016, Bethesda opened a new Urgent Care, Women’s Health and Imaging Center in Wellington, providing additional outpatient services to serve this community. Visit us at www.BethesdaWeb.com.